I was expecting three feet of snow outside my front door last week during our ‘almost-snowmageddon.’ If we lost power, I planned to blog about the wonders (…or failures) of my still-unused Generac LP5500 portable generator. Instead, the predicted snowpocalypse was just an average half-foot snow event. So I had the opportunity to record a few magical moments of my son playing in the barely-adequate snowdrifts. Using my iPhone 6 Plus, I captured some great action shots in our sloped back yard of my four year old sliding down on his dark blue snow saucer. Later, we enjoyed some hot cocoa, and then I stitched together my four snow clips in iMovie on my iMac. And then I uploaded my two-minute flick to my Vimeo page to share with family and friends. Uh Oh. I’m Almost Out of Storage. 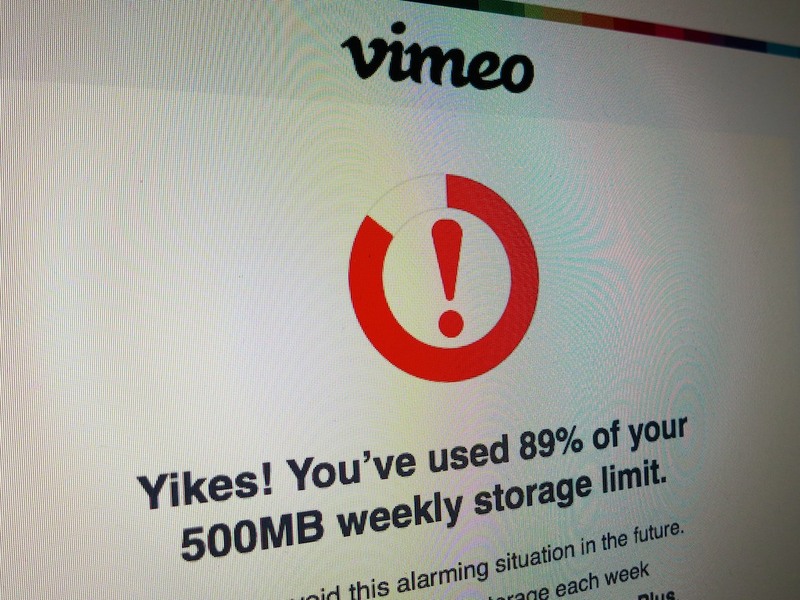 The next day, I received a worrisome email from Vimeo warning me that my weekly upload limit of 500MB for my ‘basic’ account had almost been gobbled up. This was a tiny 120-second video. Why was it so huge? And then I looked more closely at the file size. In fact, it was a whopping 477MB! That’s right. I almost blew through my half-gigabyte Vimeo limit on my free account with one little upload. Movie Inspector is a little black box that pops up and includes a bunch of geeky technical info about your video clip. The problem was the frame rate. I had unknowingly shot my snow videos at 60 frames per second… as opposed to the standard 30 fps. And remember, these are glorious 1080 high definition iPhone videos we’re talking about. So it’s the 60 fps that created the significantly larger files. I think I had left my iPhone on 60 fps quite by accident from an earlier experiment to see how 60 fps would handle action shots. I quickly pulled my iPhone 6 Plus out of my pocket (yes, it fits) and touched the Camera icon. I swiped the shoot setting to ‘Video’ and spotted the ’60 fps’ noted on the bottom right. I tapped it assuming it would toggle back to 30 fps. But it didn’t. In the moment, when you need to capture a priceless video, it’s not the easiest of settings to adjust. So you should decide which will be your ‘standard’ frame rate. Typically, I don’t think you need all those extra frames and the massive files 60 fps generates. Plus, you should remember that 60 fps creates that ‘hyper’ clear look, which may not be what you want. Is 60 FPS a Drag? But is it such a huge problem to always leave the 60 fps mode on? Well, not immediately, and not if you don’t shoot lots of videos on your iPhone 6. But I wouldn’t simply set it and forget it. Otherwise, you’re going to find yourself running out of space on your iPhone pretty quickly. Let’s say you’ve got the entry-level 16GB iPhone 6, and you shoot just a few minutes of family videos every weekend at 60 fps. That means you’re probably creating about 2 GB of content a month. At that rate, unless you transfer/delete the files from your iPhone, you’re not going make it to the summer before your iPhone runs out of memory. Generating huge video files is simply a drag. It’s a burden on your technology and by association an extra load on your life to keep your tech happy. If you’re a basic account Vimeo user, you’re allowed to create one HD video per week… and only at 720p. Trying to upload a 1080p file at 60 fps still just gets you a 720p video at 30 fps. Any extra quality is wasted. Even a Vimeo Plus membership (costing $60/year) doesn’t play your videos back at any higher frame rates than 30 fps. Yes, you can certainly compress your advanced video files to something more digestible for Vimeo, but that’s an extra step for a busy parent of a four year old. I should also freely admit that the iMovie app for iPhones/iPads can send your videos directly to Vimeo and compresses them as part of the export. Yes, it’s an easier process, but it assumes all your video clips are being generated by your iPhone. Otherwise, one day soon… your universe may start to unravel. You are a moron, and the reason lay people shouldn’t own Macs. It makes them lazy, and they don’t know how to do anything in the real world. Hint: Encode to a more effecient codec. MOV files are notoriously wasteful … like most things Mac.